With less than ten days to go until Samsung’s Galaxy S4 launch event, you can bet the phone will remain in the news right until the last moment, by way of both official Samsung promotions (like the follow-up to its awful teaser video) and through leaks such as the latest from @evleaks. The often reliable @evleaks Twitter account has published a supposed picture of the Galaxy S4 along with a few spec details; which although interesting, doesn’t mention the two most important points – screen size and the processor. Instead, it indicates the phone will have a 13-megapixel camera with autofocus and an LED flash, a choice of three different memory sizes – 16GB, 32GB or 64GB – plus 2GB of RAM, and Android 4.2 Jelly Bean. Joining this brief feature list is a picture of the phone, which is very similar to an image leaked earlier this year. The phone resembles other devices in Samsung’s range, including the Galaxy Note 2 and Galaxy Premier, but again it doesn’t have a hardware home button. There are differences between the two pictures, as this latest phone is noticeably wider and has a very slim section under the screen. Samsung concealed the design of the Galaxy S3 right up until the last moment, so we’ve no reason to view this picture of the S4 as anything other than fantasy at this point. 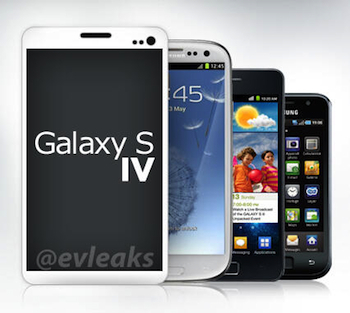 Galaxy S IV or Galaxy S4? One thing that bothers us about the image is the “Galaxy S IV” script across the center. It’s a different font to the one Samsung used for the Galaxy S2 and Galaxy S3, and uses Roman numerals for the number four. While it has used Roman numerals in the past, all official mention of the Galaxy S4 this time around has substituted the IV for the number 4, signifying it’s about to shift to a more convenient system just as the numerals are getting unwieldy. To illustrate the size of the Galaxy S4, a family picture has also been leaked, which shows the S4 flanked by the S3, S2 and original Galaxy S. Quite apart from the overall size difference, it’s interesting to see how closely the S4 resembles the Galaxy S2 – a design which got Samsung in trouble with Apple – rather than the curvy Galaxy S3. Will the removal of the home button be enough to avoid the wrath of Apple’s legal team? In case your thirst for Galaxy S4 leaks has been satiated, a benchmark test supposedly from the S4 has also been spotted this week. According to the results, the phone will have a 4.99-inch, 1080p screen, 2GB of RAM, a 13-megapixel camera, Android 4.2, and most interestingly of all, the Exynos 5 Octa processor. Whether the Galaxy S4 will use Samsung’s chip or a Qualcomm Snapdragon 600 is one of the final mysteries concerning the device, with both options appearing to be as likely as each other at this stage. All the above is rumor at the moment, and we’ll have to wait until Samsung announces the Galaxy S4 on March 14 in Times Square, New York for the full story. Update on 03/07/13, 11:00am by Andy: The image seen here is not what it seems, as according to Expansys France, it was mocked up by their designers for use on its website, but subsequently used by @evleaks without permission. Proof again not to pay too much attention to leaks. We’ve updated the specs and be sure to check out benchmarks here.